2D Foam Bell Prop - Dino Rentos Studios, INC.
A decorative bell for any theme and retail display. Especially useful for a Christmas theme. This is a flat foam prop hand painted by our artists. 2" thick. Hang on a wall or from ceiling. 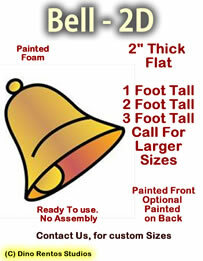 Call us to have your custom bell created!